It’s a Merry Monday with In the Woods Framelits! 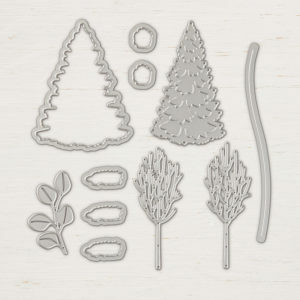 It’s time for another Merry Monday project! 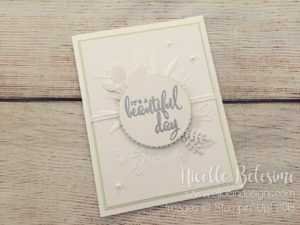 My card today features the In the Woods Framelits, the Feather & Frost stamp set, Softly Falling Textured Impressions Embossing Folder, and Joyous Noel Glimmer Paper! 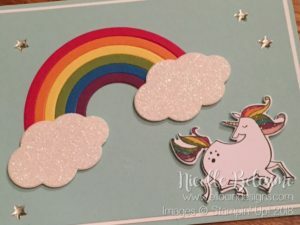 This card was fun to make, and I love the end result! 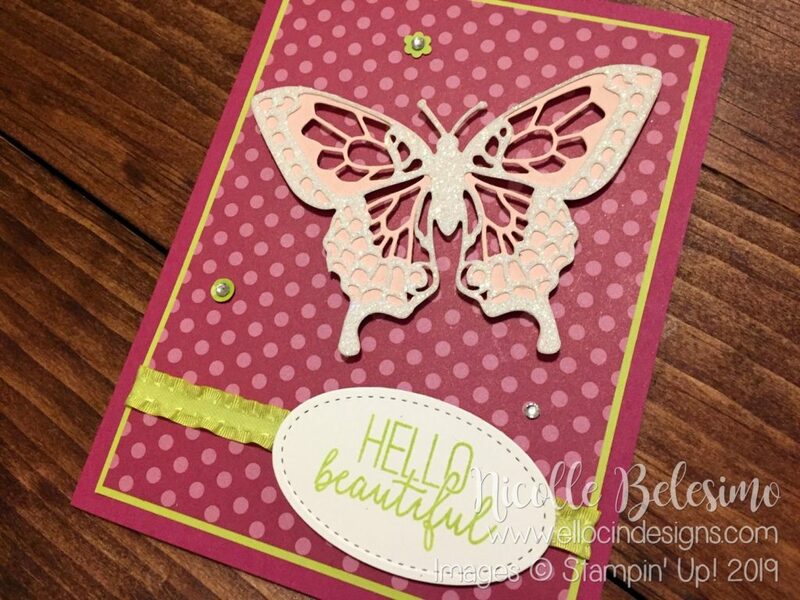 I decided not to embellish it further, as I felt that the glimmer paper and background embossing were enough. But a few rhinestones or sequins would probably add a nice touch if you wanted to dress it up a bit more! Last week, I read a blog post about a card that was scented with essential oils. I was completely intrigued, so I decided to give it a try myself! The key is to mix the essential oil with embossing paste. 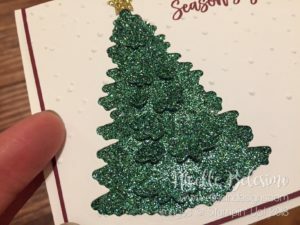 For this card, I decided to use peppermint essential oil. 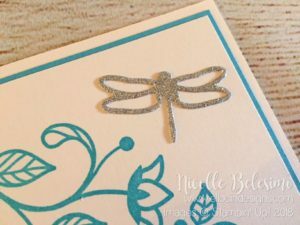 I added one drop of the oil to 1/2 tablespoon of the embossing paste and mixed well before applying it to the card. It smells so good! This card uses a mix of products from the annual catalog, both new and returning. 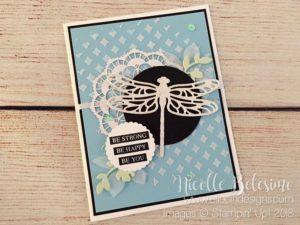 The dragonfly was made using the Detailed Dragonfly Thinlits and there are also some vellum leaves made with the Leaf Punch. Both of these items are returning favorites from previous catalogs! 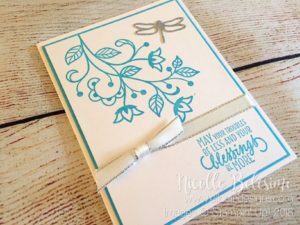 New products include the Colored Doilies (I used the white side), the Rooted in Nature stamp set for the sentiment, and the upcoming Stitched Seasons Thinlits dies for the light green leaves (available August 1st). The card was embellished with some Whisper White 1/8 inch sheer ribbon and a few iridescent sequins. The scent definitely adds something different! (Although I couldn’t help but want to eat it at one point! LOL!) If you have any questions about how this card was made, please let me know! 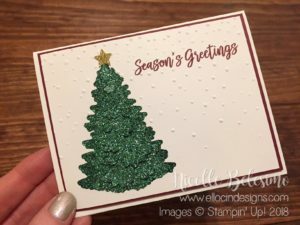 Stitched Seasons Meets Sunshine Wishes! 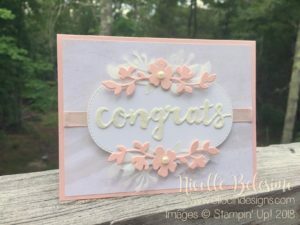 Today’s card features the upcoming Stitched Seasons Framelits dies, along with the Sunshine Wishes Thinlits and Petal Promenade Designer Series Paper! The Stitched Seasons Framelits are part of the August 1st release of the Stitched Seasons products. I recently wrote a post about this new bundle, with all the relevant info regarding release dates, products, and more! If you missed it, you can read all about it HERE. 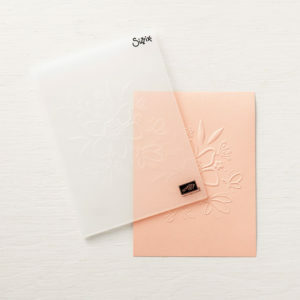 For today’s card, I made a wedding card with Powder Pink and White for the colors. 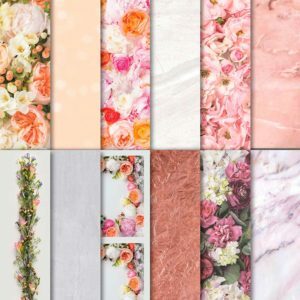 I used a pattern from the Petal Promenade Designer Series Paper that looks almost like stone for the background, and accented it with Powder Pink shimmer ribbon, as well as some floral die cuts in both Powder Pink and vellum. 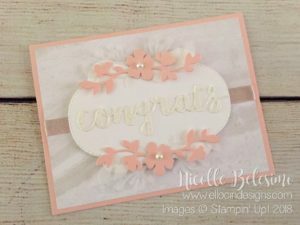 This card is perfect for a wedding, and is so pretty and sparkly in person! I hope you like it! 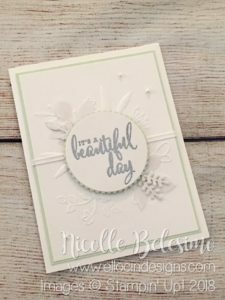 Right now, you can get the Love What You Do stamp set and the Lovely Floral Embossing Folder as part of the Gotta Have It All early release bundle in the online store! In addition to the two gorgeous items mentioned above, you also get a bunch of other items from the new Share What You Love Suite, as well as THREE FREE GIFTS with your purchase! To see the full bundle and what is included, please click HERE. If you have any questions about this card, please feel free to ask. Thank you for visiting today! 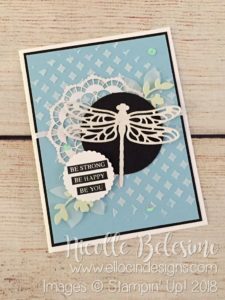 Today’s project is another project made with the Love What You Do stamp set! (Can you tell it was my favorite of the three sets I received for OnStage?) 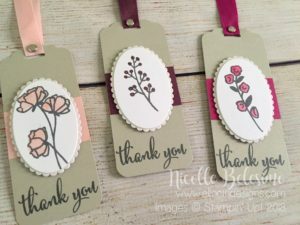 This time it’s a set of three Thank You tags! 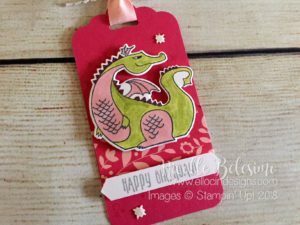 Each tag features a different floral stem from the stamp set, as well as a different 2017-2019 In Color. Each floral image is framed in a scalloped oval of Dazzling Diamonds Glimmer Paper, and was cut using the Layering Ovals Framelits. 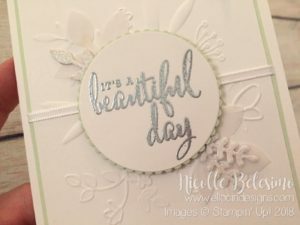 The floral images and sentiments were stamped in Basic Gray Archival Ink, and the flowers were colored using an Aqua Painter. 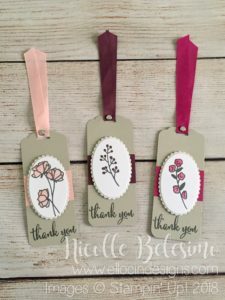 The flowers were colored in the same color ink as the ribbon used on each tag. 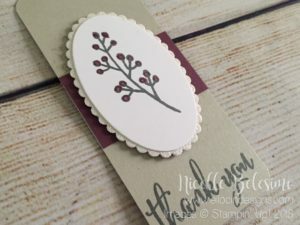 The three colors that were used are Powder Pink, Fresh Fig, and Berry Burst. 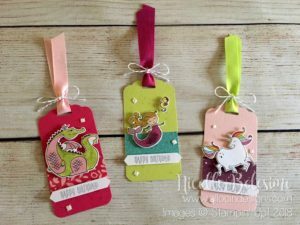 The finished size of each tag is 2 x 4-7/8 inches. 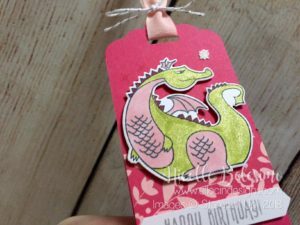 The top of each tag was punched with the Scalloped Tag Punch. (Using the punch takes about 1/2 inch off of the cardstock, so you need to add another 1/2 inch to the length before punching it!) The bottom corners were rounded using the corner rounder on the Envelope Punch Board. Each tag is finished with a silver brad, which will be available in an assortment of brads when the new catalog becomes available in June. The ribbon is all 1/2 inch Finely Woven Ribbon, in either Powder Pink, Fresh Fig, or Berry Burst, to match the color used on the flowers. And there’s a little bit of Wink of Stella on each flower to give a little extra shimmer and shine! 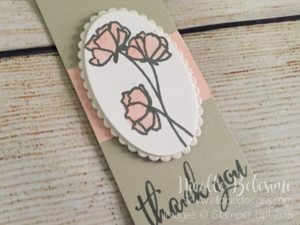 The base of each tag is Sahara Sand card stock, and each framed floral image was adhered with Stampin’ Dimensionals to give the tags a little height and texture! 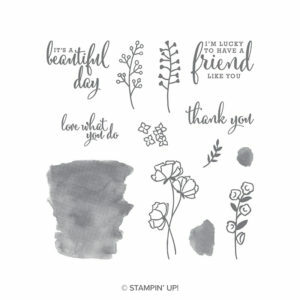 Tomorrow, I will be sharing information on how you can get this stamp set as part of the Share What You Love Suite Early Release, starting May 1st! 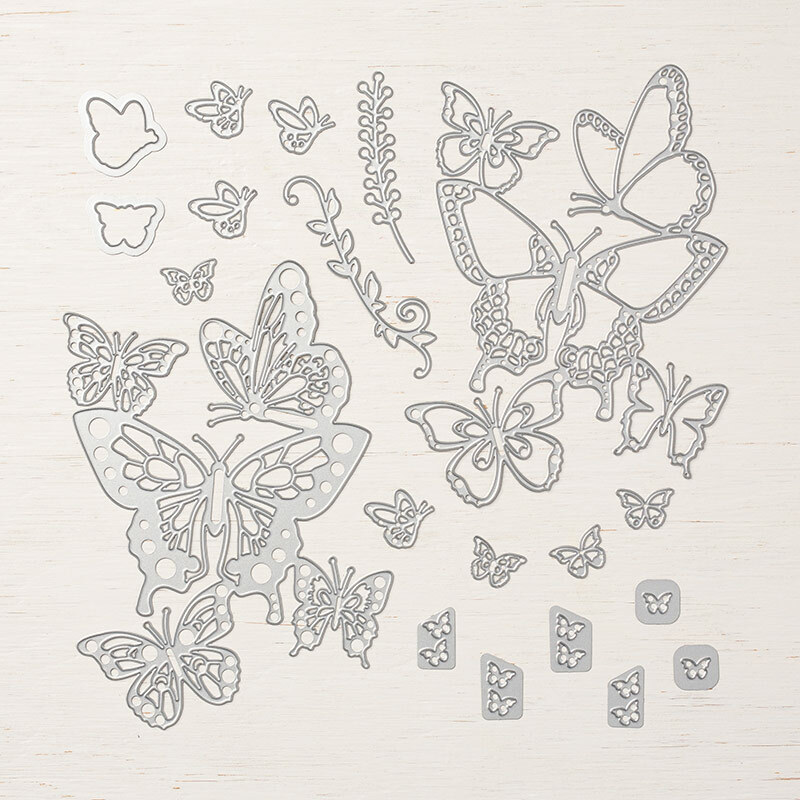 There will be three exclusive bundles which feature this stamp set, with each bundle including at least one FREE GIFT! There will also be a special offer on the NEW 2018-2020 In Colors! Please be sure to check back tomorrow for all the details on this exciting promotion! Thanks for visiting today! Enjoy the rest of the weekend! 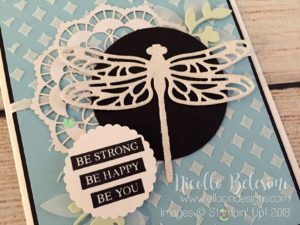 Here’s another sample from my display board made with the Love What You Do stamp set! 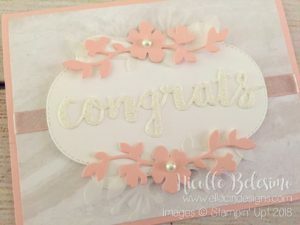 This one has pretty florals and vellum leaves, with a little shimmer and glitter! 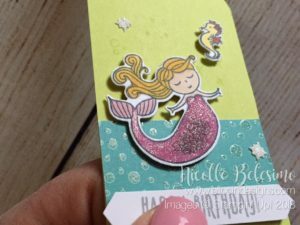 The main color is Wild Wasabi, which is one of my favorite colors (and is sadly retiring), and is paired with Shimmery White cardstock, as well as Dazzling Diamonds Glimmer Paper and silver accents. 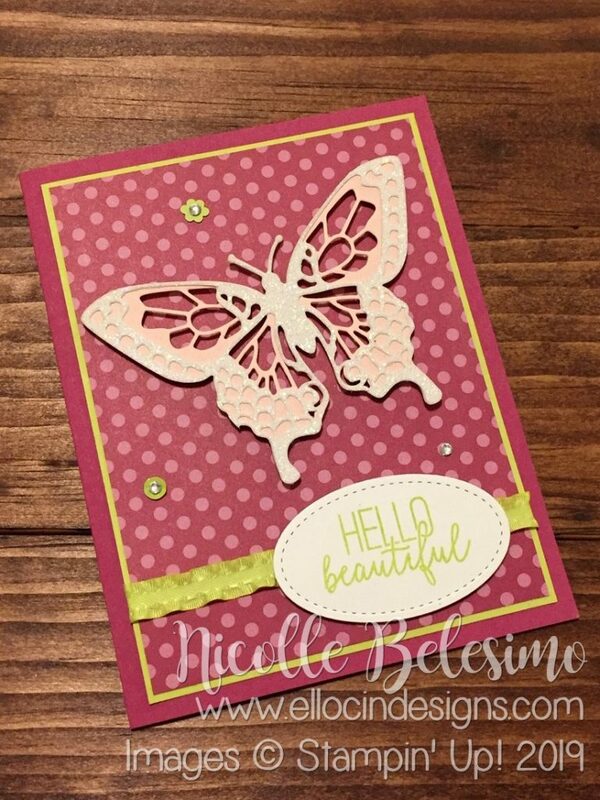 This card was stamped using the largest floral stamp from the Love What You Do set in VersaMark ink in the corners. Once the ink was dry, I went over the images with Clear Wink of Stella. 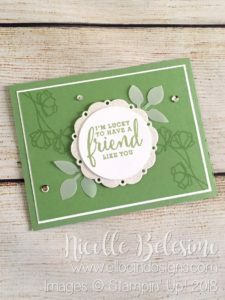 The doily looking piece behind the sentiment was cut using a cutting die from a brand new set called Spot of Tea Framelits (available June 1st!) The sentiment was adhered to the glimmer piece and then adhered to the card with dimensionals. I then added in the vellum leaves and adhered them with mini glue dots. 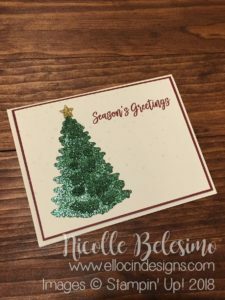 The card was finished with a few silver sequins from the Metallics Sequin Assortment. Thank you for stopping by today! Enjoy your weekend! This weekend, I wanted to make some cards with colors I rarely use. 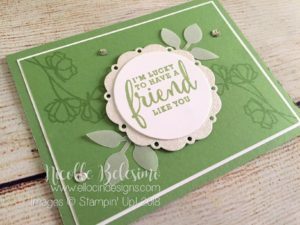 I have my favorite colors, but Stampin’ Up! has such a huge, gorgeous color palette, that I really need to start using some of the other colors more often! For this card I decided to use Tempting Turquoise as the main color, and added some silver accents to make it pop! 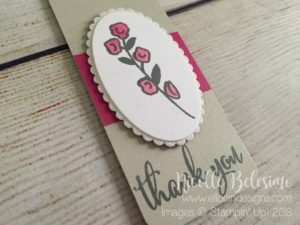 The flourish comes from the Flourishing Phrases stamp set, and the sentiment comes from the Barn Door set. 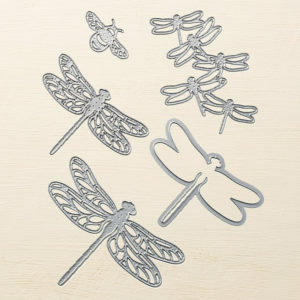 I also cut a dragonfly from Silver Glimmer Paper using the Detailed Dragonfly Thinlits Dies, and finished it off with Silver 3/8 Inch Metallic-Edge Ribbon! 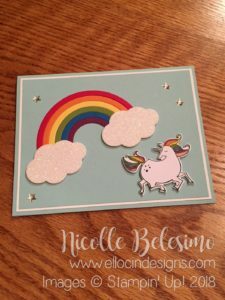 I used the Rainbow Builder Framelits Dies to make the rainbow in Brights cardstock colors. I used Real Red, Pumpkin Pie, Daffodil Delight, Old Olive, Pacific Point, and Rich Razzleberry. 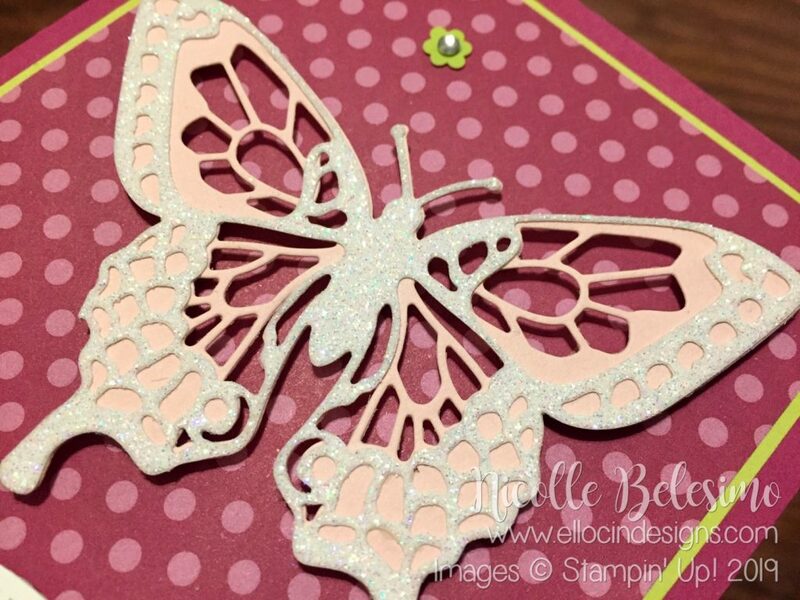 I also cut the clouds from the same set in Dazzling Diamonds Glimmer Paper, just to give the card a little sparkle! 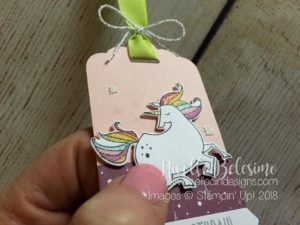 The unicorn was stamped in Memento Ink, cut out with the coordinating die from the Magical Mates Framelits Dies (which are part of the Magical Day Bundle) and colored the mane, tail, and horn with Stampin’ Blends. I finished off the unicorn by brushing a little Clear Wink of Stella on the colored areas! 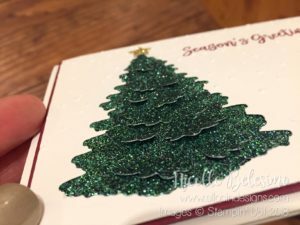 I finished off the card by adding some silver metallic stars from the Metallics Enamel Shapes, and it was done! Simple, but also bright, colorful, and fun! 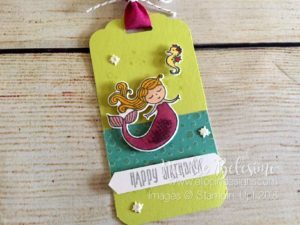 As in the first set, I added Wink of Stella to each tag to give them each a little shimmer and shine! (I’ll admit, I added a little more to this set to make them extra sparkly!) This time, I added it to the dragon’s body, the mermaid’s body, and the unicorn’s mane, tail, and horn. I love how the Wink of Stella gives them just enough shimmer to be pretty without the glitter being overwhelming! And it doesn’t make a huge mess, which is an added bonus! You just brush it on and it stays put! 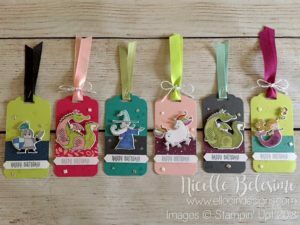 The backgrounds of each tag were stamped with stars and bubbles from the Magical Day set in Versamark ink, and I embellished with some die cut stars cut from Dazzling Diamonds Glimmer Paper. Each tag was topped using a different color of In Color 1/2 Inch Finely Woven Ribbon, and is also tied with a Silver Baker’s Twine bow. I love how they came out! 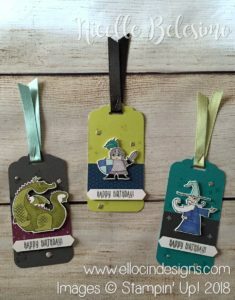 Don’t forget, the Magical Day bundle includes both the Magical Day stamp set, as well as the Magical Mates Framelits and is discounted 10% off the price of both items individually! 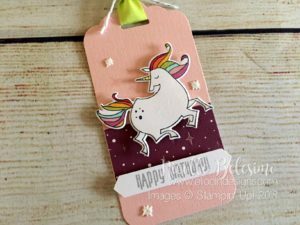 I hope you like these tags as much as I do! Thanks for stopping by today!